Whether you’re looking for a hearty low-calorie substitute or a meaty yet meatless meal option, the eggplant is an excellent choice. Simply bake eggplant slices with olive oil and salt and you’ll have the perfect base for everything from appetizers to entrees. Snack on baked eggplant slices served with a savory dip as a precursor to the main course, add a new twist to a traditional Caprese salad by incorporating a layer of eggplant or pile eggplant discs with your choice of toppings to create mini eggplant pizzas. 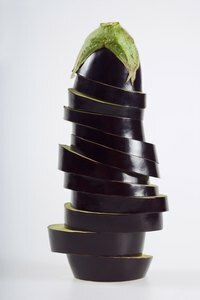 Cut the eggplant with a sharp knife -- either lengthwise or width-wise -- into slices about a 1/2 inch thick. Sprinkle generously with salt and let drain in a strainer for at least 30 minutes to an hour, until liquid begins beading on the eggplant slices. Salting the eggplant slices prior to cooking draws out bitter flavors and prevents the eggplant from absorbing too much oil by collapsing the air pockets that trap grease. Rinse the eggplant with cool running water to remove the salt. Firmly squeeze the eggplant slices in the palm of your hand to ring out most of the moisture, and pat dry with paper towels. Preheat your oven to 350 degrees Fahrenheit. Brush both sides of the eggplant slices with a small amount of olive oil, and sprinkle with salt. Arrange the eggplant slices in a single layer in a glass baking dish. Bake eggplant slices for approximately 20 minutes, or until they are completely cooked through and tender. Remove the eggplant slices from the oven, and sprinkle with fresh Parmesan cheese or fresh chopped basil, or serve with a side of roasted tomato sauce or a creamy lemon dill dip. Eggplants can have tough skins which can be removed by peeling prior to cooking if you would prefer not to eat it. However, you may prefer to leave the skin on, or even partially peel it in a striped fashion if you want a mixture of textures.